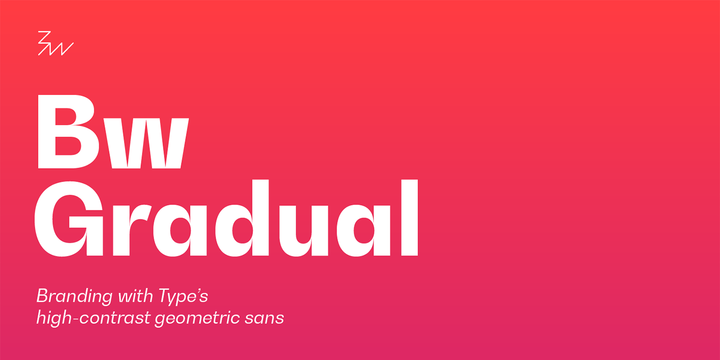 Bw Gradual is a geometric sans serif typeface created by Alberto Ramos and published by Branding with Type which is available in 7 weights (from Thin to Black) and their italics, useful OpenType features and language support. This versatile font is characterized by deep inktraps, slightly taller old-style figures, balanced x-height & diacritics, eroded stems, thin brackets & hyphens, 10° oblique and horizontal terminals. It works great on advertising, editorial use, packaging, signage magazine and so on. Enjoy! Price: starting from $22,50 for one font to only $189,00 for all 14 fonts. A font description published on Tuesday, May 16th, 2017 in Alberto Romanos, Branding with Type, Fonts by Alexandra that has 3,279 views.